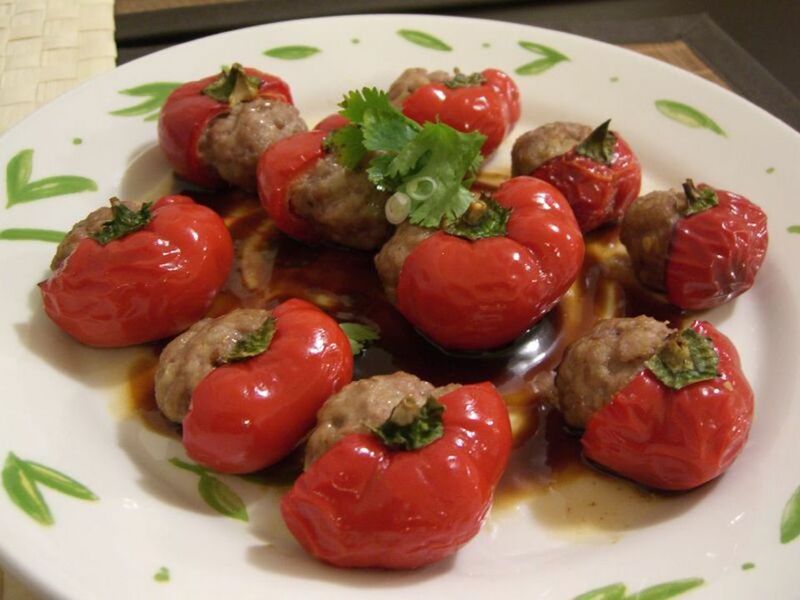 The recipe calls for cutting the bell peppers in half, but if you like you can also leave them whole and fill with about 3/4 cup of the pork mixture (blanch the peppers first as called for in the recipe). In a medium bowl, combine the ground pork with the soy sauce, rice wine or dry sherry, black pepper and cornstarch, using your fingers to mix it in and adding the cornstarch last. Marinate the ground pork for 15 minutes. While the pork is marinating, prepare the other ingredients: blanch the peppers in boiling water for 5 minutes, or until they are tender but firm. Remove with a slotted spoon and drain in a colander. Combine the chicken broth, brown bean sauce, rice vinegar and sugar in a small bowl. Set aside. Chop the shallots, garlic, and green onion. Heat a frying pan over medium heat and add 2 teaspoons oil. Add the shallots and garlic. Turn the heat up to medium-high and cook, stirring for about 2 minutes until the shallot begins to soften. Turn the heat down to medium and add the ground pork. Cook the pork, stirring and breaking it into pieces until it loses its pinkness (about 3 minutes). Re-stir the brown bean sauce mixture and add it into the frying pan. Continue cooking for another 3 minutes, until the liquid is nearly evaporated. Remove from the heat and stir in the sesame oil. Spoon a portion of the mixture (about 6 tablespoons) onto each of the bell pepper halves and serve.